This chilling and inventive documentary, executive-produced by Errol Morris (The Fog of War) and Werner Herzog (Grizzly Man), examines a country where death squad leaders are celebrated as heroes, and are challenged to reenact their real-life mass killings in the style of the American movies they love. The hallucinatory result is a cinematic fever dream, an unsettling journey deep into the imaginations of mass murderers and the shockingly banal regime of corruption and impunity they inhabit. 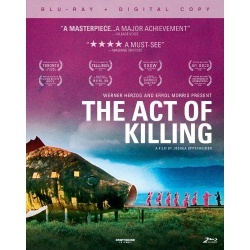 The Act Of Killing is an unprecedented film that, according to The Los Angeles Times, "could well change how you view the documentary form."